Chefs at Jeepney Guy, FOB Kitchen, and others put their own twists on lechon, lumpia, and the classics. Chef and cookbook author Yana Gilbuena said Filipino chefs are authentic because they’re telling their own stories. From tacos to soul food, the East Bay is awash in food options. But there have been few Filipino restaurants — somewhat surprisingly, given that Filipinos are the largest Asian American population in California. Recently, however, that's changing. Several new Filipino restaurants have opened or are soon opening in Oakland, notably Jeepney Guy and FOB Kitchen. These new restaurants join pop-ups Likha, the Lumpia Company, and Flip N Soul, along with takeout counter Lucky Three Seven. Their presence reflects a new generation of self-taught Filipino American chefs who are inspired by tradition but, drawing on their own experiences, reinterpret classic dishes for a broader crowd. Jeepney Guy offers inventive takes on everyday Filipino fare. Chef Dennis Villafranca is known for his version of crispy lechon, rolled pork belly that's slow-roasted for hours. Located inside the newly erected cultural hub of 7th West in West Oakland, the restaurant allows patrons to eat and drink while listening to DJs and enjoying an array of arcade games as well as a vibrant gallery space. Jeepney Guy offers catering services and regularly participates in festivals like BottleRock and the mobile-food gathering Off the Grid. Villafranca has worked hard to turn his popularity as a caterer and food stand into a permanent presence in Oakland. "The first time I did the Eat Real Festival in Jack London Square, my wife and I looked at each other and realized Oakland was the place for us because it's a different vibe," said Villafranca. "The way they embraced our food has been different than anywhere else. It's hard to describe, but it just feels right." To appeal to his new customer base, Villafranca serves his interpretations of Filipino classics, including pork belly hash and vegan sisig. Traditionally, sisig is made from parts of a pig's face, cheek, and ears and is served sizzling-hot, with a fried egg. However, Villafranca's version uses rice cakes instead of pork. It's also gluten- and soy-free, with coconut aminos in place of soy sauce, and has become surprisingly popular. "It's probably my favorite dish on the menu right now," he said. "Making dishes like that are challenging but I know I need them here in Oakland. We're working on it and still tweaking things. I want to get it to a point where you don't miss the pork. I want people to forget that it's a vegan dish." In contrast, the creation and evolution of FOB Kitchen is that of a love story. Owners Janice and Brandi Dulce met eight years ago while working as servers in the restaurant industry. As true foodies, they ate their way through San Francisco, enjoying each other's company and the nuances of the city's dining scene. 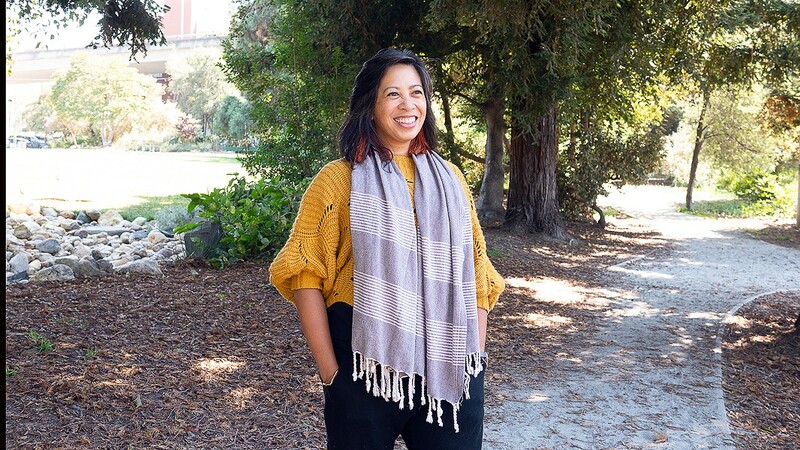 Janice, a first-generation Filipino American and Bay Area native, impressed Brandi with her passion for cooking by serving her traditional Filipino breakfasts the morning after a long night out. Brandi pushed Janice into the pop-up scene in 2015 after taking a month-long trip to visit Janice's family in the Philippines. The couple came home and shortly after set up shop in Gashead Tavern, a neighborhood bar located in the Mission. After developing a menu and building a loyal following, the Dulces are crossing the bridge to the East Bay to open their first brick-and-mortar restaurant in Temescal, which they expect to open in mid-October. "For the first time, people don't just get to taste FOB Kitchen, they finally get to feel what it's like to be in FOB Kitchen," said Brandi. "We've taken a lot of time to make it perfect. There isn't a corner of the restaurant we haven't thought about. The effort and time, blood, sweat, and tears make this place a million times more worth it." Purchased on Valentine's Day of this year, with a lot labor and love donated by friends and family, FOB Kitchen is intended to give diners a fresh, hip dining experience. The dishes are meant to be passed around family-style, making them perfect for large groups. Some highly anticipated items on the menu include house-made spam and sinigang na baboy, pork spare ribs seasoned with fish sauce and tamarind. A new cocktail program designed by Cali Gold will complement the heartiness of their food. Janice suggests ordering the Juhu Beach cocktail, a spicy rye-based homage to the space's previous tenant, Preeti Mistry's Juhu Beach Club. Along with pop-ups like Likha, the Lumpia Company, and Flip N Soul, as well as takeout counter Lucky Three Seven, East Bay diners suddenly have several more options for Filipino food. Many of the chefs interviewed for this story spoke about the deeply rooted traditions of Filipino food, passed down from strong lolas and tiyas (grandmas and aunties) to the younger generation, who are inspired by their own experiences. That's how Villafranca's vegan sisig and Alex Retodo's (of the Lumpia Company) cheeseburger lumpia have found their place on menus. As labels and identifiers have become increasingly important — used to respect and resist the marginalizing of certain communities — discussions of what this new wave of Filipino food should be called have come into question. Suggestions have included "Filipino fusion," "Filipino-American," "third-wave Filipino," and "atypical" Filipino cuisine. But Retodo has a more blunt take on labeling: "It's Filipino food because I am Filipino and I made it," he said. Retodo noted the diversity of the Philippines and its more than 7,000 islands and provinces. "Not everybody's adobo is going to be the same," he said. "Most of our parents moved to America to start a new culture of Filipino Americans. I just wanted to make something I loved. I like lumpias just as much as I like tacos." Yana Gilbuena, owner of the mobile pop-up dinner series SALO, said any criticisms of authenticity about this new wave of Filipino food are misguided. "Filipino American chefs are still authentic because they're telling their own stories," said the 34-year-old furniture designer turned chef and author. Her upcoming cookbook, No Forks Given, wraps up her ambitious project transporting her eatery across 50 states in only 52 weeks. Using the ingredients she found on hand and at local farmers' markets, Gilbuena combined Filipino tradition with local flavor. Using San Francisco as her home base, Guilbuena plans to release her cookbook sometime in the middle of October. "For the food scene in the Bay Area (or even nationally), there has been an awakening, returning to our roots because of the identity crisis that's been happening since the '90s," she said. "There were so many things that were wrong that needed to be reconstructed for Filipino American identities. I am glad that food is a medium for them to get in touch with who they are and who they want to be." Gilbuena is referring to history — and, specifically, the fact that Spain sold the Philippines to the United States for $20 million in 1898. The U.S. changed the education system in the Philippines, forcing Filipinos to assimilate to American standards, who thus made adjustments to themselves and their food. After years of internalizing a colonized mentality, the new generation has embraced their roots. This is where the need for community comes in. These self-taught Filipino American chefs are not only participants in a culinary rejuvenation but they're also friends who have a healthy competitive attitude and hold each other accountable for what gets put onto a plate. Mark Legaspi, co-owner of East Oakland's Lucky Three Seven, describes his food as full-on, stick-to-your-gut comfort food from your mama's house. With bright colors and graffiti adorning every inch of the space, the take-out window is the embodiment of Oakland's community. The restaurant takes an active involvement in the neighborhood, making donations for kids' back-to-school drives and throwing one heck of a block party as part of the Town's annual National Night Out. Legaspi said they'll be closed for two weeks starting Sept. 19 as they plan to fly all their employees to the Philippines, awarding them for their dedication and hard work.